There’s been some exciting advances made in the last decade, when it comes to waterproofing materials for decks; owners now have a wide selection of quality finishes and applications to consider for their projects. The outside surface decks of buildings or homes, usually are constructed of wood materials. There’s good reason for this, yet they need regular maintenance and care. Let’s discuss this more and look at how to prepare for a deck waterproofing installation. Sometimes an idea is only a picture away, when before it was simply unknown. Deck owners will first want to know their options, when it comes to building or refinishing their decks. This could be refinishing them with a clear water sealer product, waterproof membrane, rubberized coating, or a Pli-Dek System. The Pli-Dek waterproof coating systems are applied over plywood, using a 2.5 galvanized metal lath and a polyacrylic emulsion base coat, with a wide variety of finish options. These finish options can be for: functionality, aesthetics, or a mixture of both. This deck waterproofing option is one owners should consider for new construction and/or reconstruction projects, using plywood decks for outside surfaces instead of cedar boards. Whatever waterproofing materials and options are decided upon, owners have to coordinate and prepare for the project installation itself. This project is sure to be loud, messy, and disrupt the business or home for a time. The variables of each project will determine the extent of these interruptions, yet here are some general tips. – Clear out the area at the time of the installation: make sure everyone in the building and home know to keep out of the clearly designated work areas. The crew will be there during daylight work hours, therefor: parking, bathrooms, and cleared out space, are needed for the duration. – Don’t micro-manage the project: after owners welcome and introduce the crew to the work site and explain any details, the crew should be left alone to do the job til it’s completed – relaying to owners any questions, concerns, and/or updates. These are experts in waterproofing deck installations, so allow them the space and time to go through the installation process, without micro-managing (or changing) the project details. – Enjoy the Process: Even if the project is simple and basic, owners can still enjoy the process of having their decks waterproofed. This could be a month-long construction of a backyard oasis with a brick waterproof deck finish, or an exquisite restaurant veranda with an elegant waterproof marble finish (over the plywood substrate). Whatever the project entails, simply, try to enjoy the process by trusting it will come out great — cause most likely it will. – Coordination with Supervisor: Owners do need to coordinate with the supervisor of the crew, in order to know: when any sanding and/or the application of chemical based products will be done. These could present a dangerous and/or uncomfortable environment for those too close to the project during those times. The best option would be to leave the entire house or building during these times, if not for the entire project. 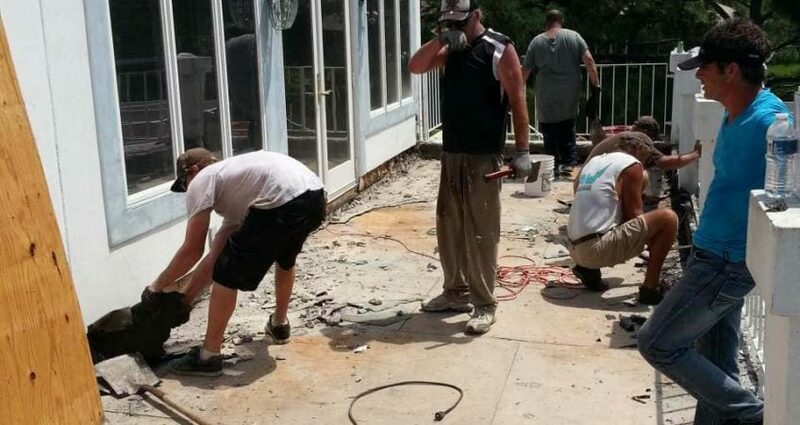 Preparing for a waterproof deck installation starts with building and home owners knowing and deciding on the right option for their new construction or reconstruction projects. The simplicity or complexity of the project will determine the extent of the preparations needed to accommodate it. Staying clear of the project area, providing bathroom and water needs to crews, resisting the temptation to micro-manage the project’s details, and enjoying the process – are easily facilitated by owners that prepare with for-sight. Owners should consider finding a contractor that uses Pli-Dek’s products, including: waterproof deck coatings, fluid applied waterproofing membranes, epoxy flooring, and concrete coatings; we’ve all seen the finished results in: commercial office buildings, retail environments, apartment balconies, backyard decks, and more. To learn more about what waterproofing materials are available, please contact us today.